Great podcast for software engineers/developers, regardless of languages you know or use. I especially enjoyed the episodes on algorithms and data structures. Only downside is that the episodes are quite long. Good humor, Nice flow in conversation and technical insight in a wide range of code related subjects. Good podcast for exploring intermediate to more advanced programming practices. The hosts share their real world experience with suggestions on how to improve and what to avoid. Only drawback is they sometimes talk over each other. <img width="150" height="99" src="https://www.codingblocks.net/wp-content/uploads/2019/04/Episode104.jpg" class="webfeedsFeaturedVisual wp-post-image" alt="" style="display: block; margin-bottom: 5px; clear:both;max-width: 100%;" link_thumbnail="" /><img width="150" height="99" src="https://www.codingblocks.net/wp-content/uploads/2019/04/Episode104.jpg" class="attachment-thumbnail size-thumbnail wp-post-image" alt="" style="float:left; margin:0 15px 15px 0;" />We dig into the nitty gritty details of what a Progressive Web App (PWA) is and why you should care, while Allen isn't sure if he is recording, Michael was the only one prepared to talk about Flo and the Progressive Price Gun, and Joe has to get his headphones. <img width="150" height="99" src="https://www.codingblocks.net/wp-content/uploads/2019/03/Episode102.jpg" class="webfeedsFeaturedVisual wp-post-image" alt="" style="display: block; margin-bottom: 5px; clear:both;max-width: 100%;" link_thumbnail="" /><img width="150" height="99" src="https://www.codingblocks.net/wp-content/uploads/2019/03/Episode102.jpg" class="attachment-thumbnail size-thumbnail wp-post-image" alt="" style="float:left; margin:0 15px 15px 0;" />We take a deep dive into understanding why all Date-s are not created equal while learning that Joe is not a fan of months, King Kong has nothing on Allen, and Michael still uses GETDATE(). Oops. <img width="150" height="99" src="https://www.codingblocks.net/wp-content/uploads/2019/03/Episode101.jpg" class="webfeedsFeaturedVisual wp-post-image" alt="" style="display: block; margin-bottom: 5px; clear:both;max-width: 100%;" link_thumbnail="" /><img width="150" height="99" src="https://www.codingblocks.net/wp-content/uploads/2019/03/Episode101.jpg" class="attachment-thumbnail size-thumbnail wp-post-image" alt="" style="float:left; margin:0 15px 15px 0;" />After being asked to quiet down, our friend, John Stone, joins us again as we move the conversation to the nearest cubicle while Michael reminds us of Bing, Joe regrets getting a cellphone, and Allen's accent might surprise you. <img width="150" height="99" src="https://www.codingblocks.net/wp-content/uploads/2019/02/Episode100.jpg" class="webfeedsFeaturedVisual wp-post-image" alt="" style="display: block; margin-bottom: 5px; clear:both;max-width: 100%;" link_thumbnail="" /><img width="150" height="99" src="https://www.codingblocks.net/wp-content/uploads/2019/02/Episode100.jpg" class="attachment-thumbnail size-thumbnail wp-post-image" alt="" style="float:left; margin:0 15px 15px 0;" />We gather around the water cooler to celebrate our 100th episode with our friend John Stone for some random developer discussions as Michael goes off script, Joe needs his techno while coding, and Allen sings some sweet sounds. <img width="150" height="99" src="https://www.codingblocks.net/wp-content/uploads/2019/02/Episode099.jpg" class="webfeedsFeaturedVisual wp-post-image" alt="" style="display: block; margin-bottom: 5px; clear:both;max-width: 100%;" link_thumbnail="" /><img width="150" height="99" src="https://www.codingblocks.net/wp-content/uploads/2019/02/Episode099.jpg" class="attachment-thumbnail size-thumbnail wp-post-image" alt="" style="float:left; margin:0 15px 15px 0;" />We learn all about JAMstack in real-time as Michael lowers the bar with new jokes, Allen submits a pull request, and Joe still owes us a tattoo. <img width="150" height="99" src="https://www.codingblocks.net/wp-content/uploads/2019/01/Episode098.jpg" class="webfeedsFeaturedVisual wp-post-image" alt="" style="display: block; margin-bottom: 5px; clear:both;max-width: 100%;" link_thumbnail="" /><img width="150" height="99" src="https://www.codingblocks.net/wp-content/uploads/2019/01/Episode098.jpg" class="attachment-thumbnail size-thumbnail wp-post-image" alt="" style="float:left; margin:0 15px 15px 0;" />We dig into heaps and tries as Allen gives us an up to date movie review while Joe and Michael compare how the bands measure up. <img width="150" height="99" src="https://www.codingblocks.net/wp-content/uploads/2019/01/Episode097.jpg" class="webfeedsFeaturedVisual wp-post-image" alt="" style="display: block; margin-bottom: 5px; clear:both;max-width: 100%;" link_thumbnail="" /><img width="150" height="99" src="https://www.codingblocks.net/wp-content/uploads/2019/01/Episode097.jpg" class="attachment-thumbnail size-thumbnail wp-post-image" alt="" style="float:left; margin:0 15px 15px 0;" />We ring in 2019 with a discussion of various trees as Allen questions when should you abstract while Michael and Joe introduce us to the Groot Tree. <img width="150" height="99" src="https://www.codingblocks.net/wp-content/uploads/2018/12/Episode096.jpg" class="webfeedsFeaturedVisual wp-post-image" alt="" style="display: block; margin-bottom: 5px; clear:both;max-width: 100%;" link_thumbnail="" /><img width="150" height="99" src="https://www.codingblocks.net/wp-content/uploads/2018/12/Episode096.jpg" class="attachment-thumbnail size-thumbnail wp-post-image" alt="" style="float:left; margin:0 15px 15px 0;" />Just in time to help you spread some cheer this holiday season, the dad jokes are back as we dig into the details of hash tables and dictionaries. <img width="150" height="99" src="https://www.codingblocks.net/wp-content/uploads/2018/12/Episode095.jpg" class="webfeedsFeaturedVisual wp-post-image" alt="" style="display: block; margin-bottom: 5px; clear:both;max-width: 100%;" link_thumbnail="" /><img width="150" height="99" src="https://www.codingblocks.net/wp-content/uploads/2018/12/Episode095.jpg" class="attachment-thumbnail size-thumbnail wp-post-image" alt="" style="float:left; margin:0 15px 15px 0;" />We continue our deep dive into data structures, this time focusing in on arrays and array-like types as Allen gives Shania Twain some singing competition, Joe is going to owe us another tattoo, and wait ... when does Michael think C++ was invented? <img width="150" height="99" src="https://www.codingblocks.net/wp-content/uploads/2018/11/Episode094.jpg" class="webfeedsFeaturedVisual wp-post-image" alt="" style="display: block; margin-bottom: 5px; clear:both;max-width: 100%;" link_thumbnail="" /><img width="150" height="99" src="https://www.codingblocks.net/wp-content/uploads/2018/11/Episode094.jpg" class="attachment-thumbnail size-thumbnail wp-post-image" alt="" style="float:left; margin:0 15px 15px 0;" />We begin our journey into data structures by taking a deep dive into primitives while Allen makes Michael blush and Joe crashes his browser. <img width="150" height="99" src="https://www.codingblocks.net/wp-content/uploads/2018/11/Episode093.jpg" class="webfeedsFeaturedVisual wp-post-image" alt="" style="display: block; margin-bottom: 5px; clear:both;max-width: 100%;" link_thumbnail="" /><img width="150" height="99" src="https://www.codingblocks.net/wp-content/uploads/2018/11/Episode093.jpg" class="attachment-thumbnail size-thumbnail wp-post-image" alt="" style="float:left; margin:0 15px 15px 0;" />With the holiday season soon approaching, we address the most important requirements list of all ... our wish lists as Joe has to disclose a cheese powder incident, Michael hopes his Bitcoin gains some value, and Allen researches his purchases to the extreme. <img width="150" height="99" src="https://www.codingblocks.net/wp-content/uploads/2018/10/coding-blocks-episode-092-art.jpg" class="webfeedsFeaturedVisual wp-post-image" alt="" style="display: block; margin-bottom: 5px; clear:both;max-width: 100%;" link_thumbnail="" /><img width="150" height="99" src="https://www.codingblocks.net/wp-content/uploads/2018/10/coding-blocks-episode-092-art.jpg" class="attachment-thumbnail size-thumbnail wp-post-image" alt="" style="float:left; margin:0 15px 15px 0;" />This is a special episode recorded at Microsoft Ignite 2018 where John Callaway from The 6 Figure Developer Podcast joins Allen Underwood to talk about Azure Functions and CosmosDB. Find out what they are and why you might want to try them out for yourself. <img width="150" height="99" src="https://www.codingblocks.net/wp-content/uploads/2018/10/Episode091.jpg" class="webfeedsFeaturedVisual wp-post-image" alt="" style="display: block; margin-bottom: 5px; clear:both;max-width: 100%;" link_thumbnail="" /><img width="150" height="99" src="https://www.codingblocks.net/wp-content/uploads/2018/10/Episode091.jpg" class="attachment-thumbnail size-thumbnail wp-post-image" alt="" style="float:left; margin:0 15px 15px 0;" />We continue our dive into how to learn things while Michael's voice sounds an awful lot like Joe's, Joe says it's a square, and Allen says it's a triangle ... oh, and Google Feud is back! <img width="150" height="99" src="https://www.codingblocks.net/wp-content/uploads/2018/09/Episode090.jpg" class="webfeedsFeaturedVisual wp-post-image" alt="" style="display: block; margin-bottom: 5px; clear:both;max-width: 100%;" link_thumbnail="" /><img width="150" height="99" src="https://www.codingblocks.net/wp-content/uploads/2018/09/Episode090.jpg" class="attachment-thumbnail size-thumbnail wp-post-image" alt="" style="float:left; margin:0 15px 15px 0;" />We have some fun with our names, get ahead of ourselves during Survey Says, and vet Michael's tip on-air as we take a deep dive into comparing some popular Git workflows and when should we use which. <img width="150" height="99" src="https://www.codingblocks.net/wp-content/uploads/2018/09/Episode089.jpg" class="webfeedsFeaturedVisual wp-post-image" alt="" style="display: block; margin-bottom: 5px; clear:both;max-width: 100%;" link_thumbnail="" /><img width="150" height="99" src="https://www.codingblocks.net/wp-content/uploads/2018/09/Episode089.jpg" class="attachment-thumbnail size-thumbnail wp-post-image" alt="" style="float:left; margin:0 15px 15px 0;" />We wrap up our conversation on complexity and play some more over/under as Allen thinks learning is backwards, Michael doesn't write clean code, and Joe brings his dog to the discussion. <img width="150" height="99" src="https://www.codingblocks.net/wp-content/uploads/2018/08/Episode088.jpg" class="webfeedsFeaturedVisual wp-post-image" alt="" style="display: block; margin-bottom: 5px; clear:both;max-width: 100%;" link_thumbnail="" /><img width="150" height="99" src="https://www.codingblocks.net/wp-content/uploads/2018/08/Episode088.jpg" class="attachment-thumbnail size-thumbnail wp-post-image" alt="" style="float:left; margin:0 15px 15px 0;" />We continue our dive into Rob Conery's The Imposter's Handbook as Allen is Allen, Joe is Michael, Michael is Joe. <img width="150" height="99" src="https://www.codingblocks.net/wp-content/uploads/2018/08/Episode087.jpg" class="webfeedsFeaturedVisual wp-post-image" alt="" style="display: block; margin-bottom: 5px; clear:both;max-width: 100%;" link_thumbnail="" /><img width="150" height="99" src="https://www.codingblocks.net/wp-content/uploads/2018/08/Episode087.jpg" class="attachment-thumbnail size-thumbnail wp-post-image" alt="" style="float:left; margin:0 15px 15px 0;" />Joe's voice sounds funny, Allen has a theme, and Michael pours one out for Media Play as Michael's and Allen's impersonation of Joe is on point (#NailedIt). <img width="150" height="99" src="https://www.codingblocks.net/wp-content/uploads/2018/07/Episode086.jpg" class="webfeedsFeaturedVisual wp-post-image" alt="" style="display: block; margin-bottom: 5px; clear:both;max-width: 100%;" link_thumbnail="" /><img width="150" height="99" src="https://www.codingblocks.net/wp-content/uploads/2018/07/Episode086.jpg" class="attachment-thumbnail size-thumbnail wp-post-image" alt="" style="float:left; margin:0 15px 15px 0;" />We meet up around the water cooler for a quick round of lightning talks as Allen and Michael sing FizzBuzz while Joe passes the caching buck. <img width="150" height="99" src="https://www.codingblocks.net/wp-content/uploads/2018/07/Episode085.jpg" class="webfeedsFeaturedVisual wp-post-image" alt="" style="display: block; margin-bottom: 5px; clear:both;max-width: 100%;" link_thumbnail="" /><img width="150" height="99" src="https://www.codingblocks.net/wp-content/uploads/2018/07/Episode085.jpg" class="attachment-thumbnail size-thumbnail wp-post-image" alt="" style="float:left; margin:0 15px 15px 0;" />We continue digging into Rob Conery's The Imposter's Handbook as Joe explains Florida time, Allen likes greedy algorithms, and Michael shares his geography knowledge. <img width="150" height="99" src="https://www.codingblocks.net/wp-content/uploads/2018/06/Episode084.jpg" class="webfeedsFeaturedVisual wp-post-image" alt="" style="display: block; margin-bottom: 5px; clear:both;max-width: 100%;" link_thumbnail="" /><img width="150" height="99" src="https://www.codingblocks.net/wp-content/uploads/2018/06/Episode084.jpg" class="attachment-thumbnail size-thumbnail wp-post-image" alt="" style="float:left; margin:0 15px 15px 0;" />It's time we discuss algorithms we all need to know as we continue diving into Rob Conery's The Imposter's Handbook while Michael will read anything, Allen questions Greenland's name, and Joe talks wormholes. <img width="150" height="99" src="https://www.codingblocks.net/wp-content/uploads/2018/06/Episode083.jpg" class="webfeedsFeaturedVisual wp-post-image" alt="" style="display: block; margin-bottom: 5px; clear:both;max-width: 100%;" link_thumbnail="" /><img width="150" height="99" src="https://www.codingblocks.net/wp-content/uploads/2018/06/Episode083.jpg" class="attachment-thumbnail size-thumbnail wp-post-image" alt="" style="float:left; margin:0 15px 15px 0;" />We're talking databases, indexes, search engines, and why they're basically microwaves in this episode while Joe wears a polo, Allen's quick brown fox jumps over whatever, and Michael gives out fake URLs. <img width="150" height="99" src="https://www.codingblocks.net/wp-content/uploads/2018/05/Episode082.jpg" class="webfeedsFeaturedVisual wp-post-image" alt="" style="display: block; margin-bottom: 5px; clear:both;max-width: 100%;" link_thumbnail="" /><img width="150" height="99" src="https://www.codingblocks.net/wp-content/uploads/2018/05/Episode082.jpg" class="attachment-thumbnail size-thumbnail wp-post-image" alt="" style="float:left; margin:0 15px 15px 0;" />Inspired by Rob Conery's The Imposter's Handbook, we take an introspective look at ourselves to find two weaknesses and one strength while Allen shows off his vocal prowess in song, Joe needs a list, and Michael is a dash. <img width="150" height="99" src="https://www.codingblocks.net/wp-content/uploads/2018/05/Episode081.jpg" class="webfeedsFeaturedVisual wp-post-image" alt="" style="display: block; margin-bottom: 5px; clear:both;max-width: 100%;" link_thumbnail="" /><img width="150" height="99" src="https://www.codingblocks.net/wp-content/uploads/2018/05/Episode081.jpg" class="attachment-thumbnail size-thumbnail wp-post-image" alt="" style="float:left; margin:0 15px 15px 0;" />This episode we talk complexity theory while digging into Rob Conery's The Imposter's Handbook as Allen channels his inner Austin Powers, Michael finds linearly to complex to pronounce, and Joe ruins Batman for the rest of us. <img width="150" height="99" src="https://www.codingblocks.net/wp-content/uploads/2018/04/codingblocks-episode-079-featured.jpg" class="webfeedsFeaturedVisual wp-post-image" alt="" style="display: block; margin-bottom: 5px; clear:both;max-width: 100%;" link_thumbnail="" /><img width="150" height="99" src="https://www.codingblocks.net/wp-content/uploads/2018/04/codingblocks-episode-079-featured.jpg" class="attachment-thumbnail size-thumbnail wp-post-image" alt="" style="float:left; margin:0 15px 15px 0;" />It's time for more design Ant-EYE or Ant-EEE patterns as we venture into cesspool that awaits. Come find out what these patterns are, why you should, and how to avoid them. Bonus: Michael drops the term Heinz Doofenshmirtz - Joe and Allen didn't know this pattern, but maybe you will. <img width="150" height="99" src="https://www.codingblocks.net/wp-content/uploads/2018/04/Episode078.jpg" class="webfeedsFeaturedVisual wp-post-image" alt="" style="display: block; margin-bottom: 5px; clear:both;max-width: 100%;" link_thumbnail="" /><img width="150" height="99" src="https://www.codingblocks.net/wp-content/uploads/2018/04/Episode078.jpg" class="attachment-thumbnail size-thumbnail wp-post-image" alt="" style="float:left; margin:0 15px 15px 0;" />It's time for more cowbell as we have a special guest in the studio, Will Madison (@IAmWillMadison), join us as Allen finally gets tripped up trying to pronounce a name, Joe teaches us the value of practice, and Michael evacuates in a rainbow colored straight line. Clean Architecture – Are Microservices Truly Decoupled? <img width="150" height="99" src="https://www.codingblocks.net/wp-content/uploads/2018/03/Episode077.jpg" class="webfeedsFeaturedVisual wp-post-image" alt="" style="display: block; margin-bottom: 5px; clear:both;max-width: 100%;" link_thumbnail="" /><img width="150" height="99" src="https://www.codingblocks.net/wp-content/uploads/2018/03/Episode077.jpg" class="attachment-thumbnail size-thumbnail wp-post-image" alt="" style="float:left; margin:0 15px 15px 0;" />We're back with our last deep dive into Robert C. Martin's latest book, Clean Architecture, while Allen suffers from sleep deprivation, Joe shows us his dance moves, and Michael's mind is blown on how to unit test. Clean Architecture – What is the Humble Object Pattern? <img width="150" height="99" src="https://www.codingblocks.net/wp-content/uploads/2018/03/Episode076.jpg" class="webfeedsFeaturedVisual wp-post-image" alt="" style="display: block; margin-bottom: 5px; clear:both;max-width: 100%;" link_thumbnail="" /><img width="150" height="99" src="https://www.codingblocks.net/wp-content/uploads/2018/03/Episode076.jpg" class="attachment-thumbnail size-thumbnail wp-post-image" alt="" style="float:left; margin:0 15px 15px 0;" />It's time for another deep dive into Robert C. Martin's Clean Architecture as Joe puts us on the spot, Allen has a new mission, and Michael shares his Easter eggs. <img width="150" height="99" src="https://www.codingblocks.net/wp-content/uploads/2018/02/Episode075.jpg" class="webfeedsFeaturedVisual wp-post-image" alt="" style="display: block; margin-bottom: 5px; clear:both;max-width: 100%;" link_thumbnail="" /><img width="150" height="99" src="https://www.codingblocks.net/wp-content/uploads/2018/02/Episode075.jpg" class="attachment-thumbnail size-thumbnail wp-post-image" alt="" style="float:left; margin:0 15px 15px 0;" />Michael can't tell higher from lower, Allen puts his views where he wants them, and Joe snaps it to a Slim Jim as we discuss how to make our architectures scream while discussing Robert C. Martin's Clean Architecture. <img width="150" height="99" src="https://www.codingblocks.net/wp-content/uploads/2018/02/Episode074.jpg" class="webfeedsFeaturedVisual wp-post-image" alt="" style="display: block; margin-bottom: 5px; clear:both;max-width: 100%;" link_thumbnail="" /><img width="150" height="99" src="https://www.codingblocks.net/wp-content/uploads/2018/02/Episode074.jpg" class="attachment-thumbnail size-thumbnail wp-post-image" alt="" style="float:left; margin:0 15px 15px 0;" />It's time for another deep dive into Robert C. Martin's Clean Architecture as Allen warns us about driving in front of him, Joe tries to describe a diagram again, and Michael can't understand the survey results. <img width="150" height="99" src="https://www.codingblocks.net/wp-content/uploads/2018/01/Episode073.jpg" class="webfeedsFeaturedVisual wp-post-image" alt="" style="display: block; margin-bottom: 5px; clear:both;max-width: 100%;" link_thumbnail="" /><img width="150" height="99" src="https://www.codingblocks.net/wp-content/uploads/2018/01/Episode073.jpg" class="attachment-thumbnail size-thumbnail wp-post-image" alt="" style="float:left; margin:0 15px 15px 0;" />Joe drinks too much coffee, Allen spits his coffee out, and Michael feels vindicated as the discussions about Robert C. Martin's latest book, Clean Architecture, continues. <img width="150" height="99" src="https://www.codingblocks.net/wp-content/uploads/2018/01/Episode072.jpg" class="webfeedsFeaturedVisual wp-post-image" alt="" style="display: block; margin-bottom: 5px; clear:both;max-width: 100%;" link_thumbnail="" /><img width="150" height="99" src="https://www.codingblocks.net/wp-content/uploads/2018/01/Episode072.jpg" class="attachment-thumbnail size-thumbnail wp-post-image" alt="" style="float:left; margin:0 15px 15px 0;" />Joe baits Michael, Michael takes the bait, and Allen lets it happen, as Uncle Bob explains how we can quantify the coupling between our components from his latest book, Clean Architecture. <img width="150" height="99" src="https://www.codingblocks.net/wp-content/uploads/2017/12/Episode071.jpg" class="webfeedsFeaturedVisual wp-post-image" alt="" style="display: block; margin-bottom: 5px; clear:both;max-width: 100%;" link_thumbnail="" /><img width="150" height="99" src="https://www.codingblocks.net/wp-content/uploads/2017/12/Episode071.jpg" class="attachment-thumbnail size-thumbnail wp-post-image" alt="" style="float:left; margin:0 15px 15px 0;" />Joe is down with OCP, Michael argues DRY, and Allen deletes our show notes as we dig into Components and Component Cohesion from Robert C. Martin's (aka Uncle Bob) Clean Architecture. <img width="150" height="99" src="https://www.codingblocks.net/wp-content/uploads/2017/11/Episode070.jpg" class="webfeedsFeaturedVisual wp-post-image" alt="" style="display: block; margin-bottom: 5px; clear:both;max-width: 100%;" link_thumbnail="" /><img width="150" height="99" src="https://www.codingblocks.net/wp-content/uploads/2017/11/Episode070.jpg" class="attachment-thumbnail size-thumbnail wp-post-image" alt="" style="float:left; margin:0 15px 15px 0;" />We're back with another installment as we challenge ourselves to compare how we'd each spend $2,500 on developer gear as Allen waxes on about the loudest quiet keyboard, Joe teaches us how cheese is made, and Michael puts some neon on his computer. <img width="150" height="99" src="https://www.codingblocks.net/wp-content/uploads/2017/10/Episode069.jpg" class="webfeedsFeaturedVisual wp-post-image" alt="" style="display: block; margin-bottom: 5px; clear:both;max-width: 100%;" link_thumbnail="" /><img width="150" height="99" src="https://www.codingblocks.net/wp-content/uploads/2017/10/Episode069.jpg" class="attachment-thumbnail size-thumbnail wp-post-image" alt="" style="float:left; margin:0 15px 15px 0;" />Michael forgets what his favorite part of the show is, Joe makes us wait to learn what his favorite part is, and Allen pronounces it "pair-a-dig-'ems" as we continue our deep dive into Uncle Bob's latest book: Clean Architecture. <img width="150" height="99" src="https://www.codingblocks.net/wp-content/uploads/2017/09/Episode067.jpg" class="webfeedsFeaturedVisual wp-post-image" alt="" style="display: block; margin-bottom: 5px; clear:both;max-width: 100%;" link_thumbnail="" /><img width="150" height="99" src="https://www.codingblocks.net/wp-content/uploads/2017/09/Episode067.jpg" class="attachment-thumbnail size-thumbnail wp-post-image" alt="" style="float:left; margin:0 15px 15px 0;" />Allen brings the dad jokes, Michael unplugs, and Joe gets a second wind as we discuss the anti-patterns found in object oriented programming. <img width="150" height="99" src="https://www.codingblocks.net/wp-content/uploads/2017/09/Episode066.jpg" class="webfeedsFeaturedVisual wp-post-image" alt="" style="display: block; margin-bottom: 5px; clear:both;max-width: 100%;" link_thumbnail="" /><img width="150" height="99" src="https://www.codingblocks.net/wp-content/uploads/2017/09/Episode066.jpg" class="attachment-thumbnail size-thumbnail wp-post-image" alt="" style="float:left; margin:0 15px 15px 0;" />It's time for another episode as Joe wants to choke a developer, Michael scraps his new social networking platform, and Allen finally learns of dad jokes while we continuing the anti-patterns conversation. <img width="150" height="99" src="https://www.codingblocks.net/wp-content/uploads/2017/08/Episode065.jpg" class="webfeedsFeaturedVisual wp-post-image" alt="" style="display: block; margin-bottom: 5px; clear:both;max-width: 100%;" link_thumbnail="" /><img width="150" height="99" src="https://www.codingblocks.net/wp-content/uploads/2017/08/Episode065.jpg" class="attachment-thumbnail size-thumbnail wp-post-image" alt="" style="float:left; margin:0 15px 15px 0;" />We've discussed design patterns too much. Now it's time for some discussion about anti-patterns as Joe has dark visions about robots, Allen has to take sensitivity training, and Michael picks Arial. <img width="150" height="99" src="https://www.codingblocks.net/wp-content/uploads/2017/07/Episode063.jpg" class="webfeedsFeaturedVisual wp-post-image" alt="" style="display: block; margin-bottom: 5px; clear:both;max-width: 100%;" link_thumbnail="" /><img width="150" height="99" src="https://www.codingblocks.net/wp-content/uploads/2017/07/Episode063.jpg" class="attachment-thumbnail size-thumbnail wp-post-image" alt="" style="float:left; margin:0 15px 15px 0;" />Know what Joe and Waldo have in common? We can't find either, as this week, it's just Allen and Michael to continue the dive into Domain Driven Design. <img width="150" height="99" src="https://www.codingblocks.net/wp-content/uploads/2017/06/Episode062.jpg" class="webfeedsFeaturedVisual wp-post-image" alt="" style="display: block; margin-bottom: 5px; clear:both;max-width: 100%;" link_thumbnail="" /><img width="150" height="99" src="https://www.codingblocks.net/wp-content/uploads/2017/06/Episode062.jpg" class="attachment-thumbnail size-thumbnail wp-post-image" alt="" style="float:left; margin:0 15px 15px 0;" />We're not saying that Michael is Carmen Sandiego. We're just saying that nobody has ever seen them in a room together. And this week, we don't know where in the world either are, as Allen and Joe continue the Domain Driven Design discussion without Michael. Nor Carmen. <img width="150" height="150" src="https://www.codingblocks.net/wp-content/uploads/2017/06/Episode061-150x150.jpg" class="webfeedsFeaturedVisual wp-post-image" alt="" style="display: block; margin-bottom: 5px; clear:both;max-width: 100%;" link_thumbnail="" /><img width="150" height="150" src="https://www.codingblocks.net/wp-content/uploads/2017/06/Episode061-150x150.jpg" class="attachment-thumbnail size-thumbnail wp-post-image" alt="" style="float:left; margin:0 15px 15px 0;" />Stitcher is back and so are we as Michael proves he doesn't have a career as a rapper, Allen can't type on his phone, and Joe tweets with famous authors as we continue our dive into Domain Driven Design talking about aggregate roots, factories, and repositories. <img width="150" height="150" src="https://www.codingblocks.net/wp-content/uploads/2017/05/Episode060-150x150.jpg" class="webfeedsFeaturedVisual wp-post-image" alt="" style="display: block; margin-bottom: 5px; clear:both;max-width: 100%;" link_thumbnail="" /><img width="150" height="150" src="https://www.codingblocks.net/wp-content/uploads/2017/05/Episode060-150x150.jpg" class="attachment-thumbnail size-thumbnail wp-post-image" alt="" style="float:left; margin:0 15px 15px 0;" />We continue our Domain Driven Design conversation this week as Allen is indecisive, Michael decides for him, and Joe can't handle the night life. <img width="150" height="150" src="https://www.codingblocks.net/wp-content/uploads/2017/02/Episode055-150x150.jpg" class="webfeedsFeaturedVisual wp-post-image" alt="" style="display: block; margin-bottom: 5px; clear:both;max-width: 100%;" link_thumbnail="" /><img width="150" height="150" src="https://www.codingblocks.net/wp-content/uploads/2017/02/Episode055-150x150.jpg" class="attachment-thumbnail size-thumbnail wp-post-image" alt="" style="float:left; margin:0 15px 15px 0;" />This week Allen is troubled by circles, Michael talks like a game show host, and Joe announces it's twins as we continue our deep dive into the classic Clean Code book by Robert C. Martin. <img width="150" height="150" src="https://www.codingblocks.net/wp-content/uploads/2016/12/Episode052-150x150.jpg" class="webfeedsFeaturedVisual wp-post-image" alt="" style="display: block; margin-bottom: 5px; clear:both;max-width: 100%;" link_thumbnail="" /><img width="150" height="150" src="https://www.codingblocks.net/wp-content/uploads/2016/12/Episode052-150x150.jpg" class="attachment-thumbnail size-thumbnail wp-post-image" alt="" style="float:left; margin:0 15px 15px 0;" />This week, we continue our Clean Code discussion as we dive into the joys and pains of error handing. <img width="150" height="150" src="https://www.codingblocks.net/wp-content/uploads/2016/04/Episode041-150x150.jpg" class="webfeedsFeaturedVisual wp-post-image" alt="" style="display: block; margin-bottom: 5px; clear:both;max-width: 100%;" link_thumbnail="" /><img width="150" height="150" src="https://www.codingblocks.net/wp-content/uploads/2016/04/Episode041-150x150.jpg" class="attachment-thumbnail size-thumbnail wp-post-image" alt="" style="float:left; margin:0 15px 15px 0;" />This week on Coding Blocks, Joe changes a different kind of string, Allen drools over the Hellcat, and Michael shares his random thoughts. We span a collection of topics including GraphQL framework envy, bash on Windows, and whether it takes two to Django. <img width="150" height="150" src="https://www.codingblocks.net/wp-content/uploads/2015/11/Episode035-150x150.png" class="webfeedsFeaturedVisual wp-post-image" alt="" style="display: block; margin-bottom: 5px; clear:both;max-width: 100%;" link_thumbnail="" /><img width="150" height="150" src="https://www.codingblocks.net/wp-content/uploads/2015/11/Episode035-150x150.png" class="attachment-thumbnail size-thumbnail wp-post-image" alt="" style="float:left; margin:0 15px 15px 0;" />It's time for more DevOps fun as we continue learning about the Twelve-Factor app. This week we dive into the next three chapters: port binding, concurrency, and disposability. <img width="150" height="150" src="https://www.codingblocks.net/wp-content/uploads/2015/11/Episode034-150x150.png" class="webfeedsFeaturedVisual wp-post-image" alt="" style="display: block; margin-bottom: 5px; clear:both;max-width: 100%;" link_thumbnail="" /><img width="150" height="150" src="https://www.codingblocks.net/wp-content/uploads/2015/11/Episode034-150x150.png" class="attachment-thumbnail size-thumbnail wp-post-image" alt="" style="float:left; margin:0 15px 15px 0;" />The holidays are coming sooner than we realized, so we gotta get our wish lists together. After all, no one wants to sit around the Festivus Pole without their favorite dev toys. This week we discuss some of the toys we love, as well as the ones we drool over, and even the ones we're not so crazy about. <img width="150" height="150" src="https://www.codingblocks.net/wp-content/uploads/2015/07/featured-image-150x150.png" class="webfeedsFeaturedVisual wp-post-image" alt="" style="display: block; margin-bottom: 5px; clear:both;max-width: 100%;" link_thumbnail="" /><img width="150" height="150" src="https://www.codingblocks.net/wp-content/uploads/2015/07/featured-image-150x150.png" class="attachment-thumbnail size-thumbnail wp-post-image" alt="" style="float:left; margin:0 15px 15px 0;" />Part 4 of our design patterns series, this time up it's Adapters, Facades, and Mementos. Oh, an which tech luminary would make the best head of state! <img width="150" height="150" src="https://www.codingblocks.net/wp-content/uploads/2015/06/Episode029-150x150.png" class="webfeedsFeaturedVisual wp-post-image" alt="" style="display: block; margin-bottom: 5px; clear:both;max-width: 100%;" link_thumbnail="" /><img width="150" height="150" src="https://www.codingblocks.net/wp-content/uploads/2015/06/Episode029-150x150.png" class="attachment-thumbnail size-thumbnail wp-post-image" alt="" style="float:left; margin:0 15px 15px 0;" />It's that time again. This week we answer a question, Allen registers for school, Joe reads some numbers, Michael breaks out the survey results, and Joe cringes at the thought of bidets. It's time for episode 29! And we thought, what better to talk about than to continue our discussion on hierarchical data solutions. 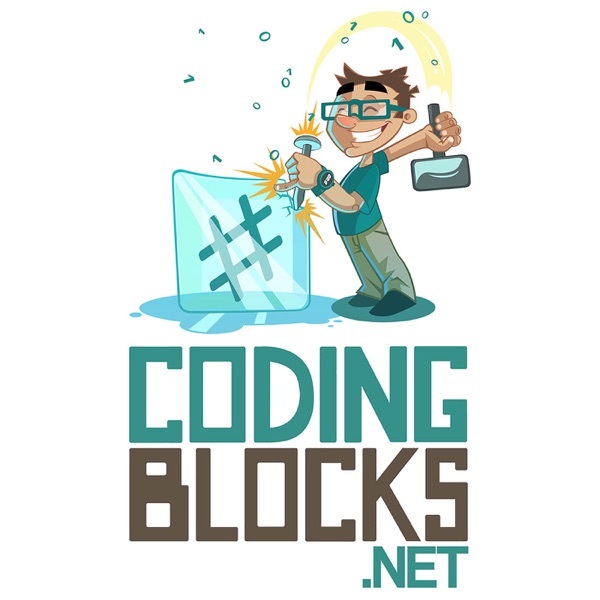 <img width="150" height="150" src="https://www.codingblocks.net/wp-content/uploads/2015/04/Coding-Blocks-Episode-26-logo-150x150.jpg" class="webfeedsFeaturedVisual wp-post-image" alt="" style="display: block; margin-bottom: 5px; clear:both;max-width: 100%;" link_thumbnail="" /><img width="150" height="150" src="https://www.codingblocks.net/wp-content/uploads/2015/04/Coding-Blocks-Episode-26-logo-150x150.jpg" class="attachment-thumbnail size-thumbnail wp-post-image" alt="" style="float:left; margin:0 15px 15px 0;" />On this episode we discuss algorithms, puzzles and how to approach them when asked to solve one in the interview process. We discuss many of the problems programmers face when being asked to solve these types of problems as well as steps to alleviate some of these common issues. We also provide a number of resources for sharpening your problem solving skills as well as a number of resources, and of course our favorite tips! <img width="150" height="150" src="https://www.codingblocks.net/wp-content/uploads/2015/03/Episode025-150x150.png" class="webfeedsFeaturedVisual wp-post-image" alt="" style="display: block; margin-bottom: 5px; clear:both;max-width: 100%;" link_thumbnail="" /><img width="150" height="150" src="https://www.codingblocks.net/wp-content/uploads/2015/03/Episode025-150x150.png" class="attachment-thumbnail size-thumbnail wp-post-image" alt="" style="float:left; margin:0 15px 15px 0;" />This week we give away Joe's stuff, we break up with IE8 like a big boy, Joe and Allen get excited about readme files, and we argue about which is worse: bad code or bad architecture. That and more in this week's episode where we explore the new bits in ASP.NET 5. <img width="150" height="150" src="https://www.codingblocks.net/wp-content/uploads/2015/03/coding-blocks-episode-24-150x150.png" class="webfeedsFeaturedVisual wp-post-image" alt="" style="display: block; margin-bottom: 5px; clear:both;max-width: 100%;" link_thumbnail="" /><img width="150" height="150" src="https://www.codingblocks.net/wp-content/uploads/2015/03/coding-blocks-episode-24-150x150.png" class="attachment-thumbnail size-thumbnail wp-post-image" alt="" style="float:left; margin:0 15px 15px 0;" />This week we tackle one of life's great quesitons, does Jack Bauer give high fives? Also, we go over everything you need to know about delegates, events, callbacks and closures in .NET. Big thanks to <a href="http://twitter.com/kappelcodesalot">@kappelcodesalot</a> for being the inspiration for this episode! <img width="150" height="150" src="https://www.codingblocks.net/wp-content/uploads/2014/12/Episode021-150x150.png" class="webfeedsFeaturedVisual wp-post-image" alt="" style="display: block; margin-bottom: 5px; clear:both;max-width: 100%;" link_thumbnail="" /><img width="150" height="150" src="https://www.codingblocks.net/wp-content/uploads/2014/12/Episode021-150x150.png" class="attachment-thumbnail size-thumbnail wp-post-image" alt="" style="float:left; margin:0 15px 15px 0;" />We gather around the Festivus pole this holiday season and before we get into the Airing of Grievances, we discuss our favorite tools. No, not people. Actual tools. Srsly. <img width="150" height="150" src="https://www.codingblocks.net/wp-content/uploads/2014/12/Episode20-150x150.jpg" class="webfeedsFeaturedVisual wp-post-image" alt="" style="display: block; margin-bottom: 5px; clear:both;max-width: 100%;" link_thumbnail="" /><img width="150" height="150" src="https://www.codingblocks.net/wp-content/uploads/2014/12/Episode20-150x150.jpg" class="attachment-thumbnail size-thumbnail wp-post-image" alt="" style="float:left; margin:0 15px 15px 0;" />I figured this title was appropriate considering it's been a month since our last episode. We've all been incredibly busy so we hope you've been patient waiting and maybe, just maybe it was worth the wait! We've crammed quite a bit into this episode which is all about testing. Follow the more link to see the show notes for this particular episode and don't forget to click one of the share buttons there to let all your friends know about the podcast! <img width="150" height="150" src="https://www.codingblocks.net/wp-content/uploads/2014/10/Episode018-150x150.png" class="webfeedsFeaturedVisual wp-post-image" alt="Episode 18 - You Asked For It" style="display: block; margin-bottom: 5px; clear:both;max-width: 100%;" link_thumbnail="" /><img width="150" height="150" src="https://www.codingblocks.net/wp-content/uploads/2014/10/Episode018-150x150.png" class="attachment-thumbnail size-thumbnail wp-post-image" alt="Episode 18 - You Asked For It" style="float:left; margin:0 15px 15px 0;" />We’re very excited about <a title="ASP.NET vNext" href="http://www.asp.net/vnext">ASP.NET vNext</a>, we’ve never been seen together, and a cute little ninja was <a title="MEAN" href="http://mean.io/">MEAN</a> to Allen. All that and more in this week’s episode where we attempt to answer some questions. Static Analysis w/ NDepends – How good is your code? What programmer do you want to be? Design Patterns Part 1 – You Create Me! Aspectacular with Vlad Hrybok – You down with AOP?